Free US address, low international shipping rates and free repacking/consolidation services! Old Navy is one of the important clothing retailer in USA today, and it offers apprel, clothing, accessories for women, men, kids and babies. What attracts customers most about Old Navy is the wide selection of clothing with varied styles that are available at quite low prices! Old Navy is owned by the famous clothing retailer Gap Inc., which makes Old Navy more attractive for those who like Gap. How USGoBuy helps overseas customers buy from Old Navy? However, Old Navy USA online store do not ship internationally, only within America. This is kind of frustrating for those international customers who want to buy from Old Navy online store in USA, as there are discounts available, normally 15% off! With USGoBuy, international customers can avail themselves of the cheap deals by Old Navy. 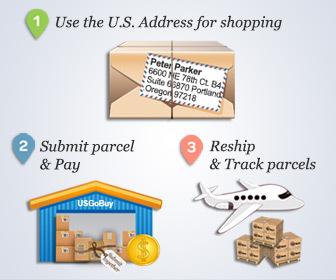 USGoBuy will give each user a tax-free US address that can be used for online shopping at any USA site. So use this USGoBuy address to buy from Old Navy! When your Old Navy order arrive at our USGoBuy warehouse, you will be notified about this arrival. Then you can simply submit international shipping request! Remember USGoBuy international shipping rates vis DHL or USPS is quite low!